2004-08-09. New. Ships with Tracking Number! INTERNATIONAL WORLDWIDE Shipping available. Buy with confidence, excellent customer service! 2001-04-01. New. Ships with Tracking Number! INTERNATIONAL WORLDWIDE Shipping available. Buy with confidence, excellent customer service! 2016-05-04. New. Ships with Tracking Number! INTERNATIONAL WORLDWIDE Shipping available. Buy with confidence, excellent customer service! 1994-04-07. Good. Ships with Tracking Number! INTERNATIONAL WORLDWIDE Shipping available. May not contain Access Codes or Supplements. May be ex-library. Shipping & Handling by region. Buy with confidence, excellent customer service! Lyons Pr, 1994-07-01. 6th. Paperback. Used:Good. 2016-05-04. Good. Ships with Tracking Number! INTERNATIONAL WORLDWIDE Shipping available. May not contain Access Codes or Supplements. May be ex-library. Shipping & Handling by region. Buy with confidence, excellent customer service! NY:: Knopf,. Very Good in Very Good dust jacket. 1952. Hardcover. First American edition (no statement of printing). Very good in a very good (minor edge wear with a few small chips, age toned along the spine) dust jacket. ; 191 pages . 1972-07-17. Good. Ships with Tracking Number! INTERNATIONAL WORLDWIDE Shipping available. May not contain Access Codes or Supplements. May be ex-library. Shipping & Handling by region. Buy with confidence, excellent customer service! 1992-01-01. Good. Ships with Tracking Number! INTERNATIONAL WORLDWIDE Shipping available. May not contain Access Codes or Supplements. May be ex-library. Shipping & Handling by region. Buy with confidence, excellent customer service! 1981-03-01. Good. Ships with Tracking Number! INTERNATIONAL WORLDWIDE Shipping available. May not contain Access Codes or Supplements. May be ex-library. Shipping & Handling by region. Buy with confidence, excellent customer service! London: Rupert Hart-Davis,, 1952.. First edition.. 191 pp. Fine in near fine dust jacket. Rupert Hart-Davis, 1966. Book. Very Good. Hardcover. Inscribed by Author(s). Reprint. "Inscribed for David Battie who will advise me, please, of any ommissions which strike him in the course of his work, in which i wish him happiness and success, John Carter 22 November 67" to front end paper. 208 pages. some foxing to page edges. A few small tears and chips to tanned jacket..
Lyons Pr. PAPERBACK. 155821318X . . New. 1994. Knopf, 1952-06-15. Revised. Hardcover. Used:Good. 2004-08-09. Good. Ships with Tracking Number! INTERNATIONAL WORLDWIDE Shipping available. May not contain Access Codes or Supplements. May be ex-library. Shipping & Handling by region. Buy with confidence, excellent customer service! Oak Knoll Press. Hardcover. 1884718051 New Condition. . New. Oak Knoll Books. Hardcover. 0938768301 New Condition. . New. Knopf. Hardcover. 0394414039 New Condition. . New. Lyons Pr, 1994-07. Paperback. Good. 2000-08-01. Good. Ships with Tracking Number! INTERNATIONAL WORLDWIDE Shipping available. May not contain Access Codes or Supplements. May be ex-library. Shipping & Handling by region. Buy with confidence, excellent customer service! Knopf. Hardcover. 0394414039 Ships promptly from Texas. . New. 1952. Oak Knoll Press, 1995. Seventh Edition. Cloth. Fine - As New/Fine in Archival Plastic Cover. A handsome Seventh Edition of John Carter's useful reference for book sellers and collectors. The perfect book for referencing the terms that dealers use to describe books. Includes even the most obscure. In fine black cloth with a bright complete dustjacket protected by an archival plastic cover. Revised by Nicolas Barker following John Carter's death. London : Werner Shaw, 1994. Seventh Edition. Fine cloth copy in an equally fine dust wrapper. Particularly and surprisingly well-preserved; tight, bright, clean and especially sharp-cornered.
. Physical description; 224 p. ; 21 cm. Notes; Previous ed. : 1980. Includes bibliographical references. Subjects; Bibliography - Dictionaries. Book collecting - Dictionaries. Dictionary - Book collecting. Book industries and trade - Dictionaries. Book collecting. Dictionaries. Bibliography. Bibliographies. Dictionaries. Books. Dictionary Bibliography - Dictionaries and glossaries. Bookselling and publishing - Dictionaries. Librarianship - Dictionaries of terms. Genre; Dictionary. Oak Knoll Press. Hardcover. 1884718051 Like New Condition. . Fine. Oak Knoll Books. Hardcover. 0938768301 Like New Condition. . Fine. Knopf. Hardcover. 0394414039 Like New Condition. . Fine. Oak Knoll Books, 1992-01-01. 6th. Hardcover. Used:Good. Alfred A. Knopf. Hardcover. B00R1LLSVQ Ex-library book with usual markings. Has loose spine/binding. Meets the acceptable condition guidelines. Has wear. Five star seller - Buy with confidence! . Fair. NY: Alfred A. Knopf. Very Good+ in Very Good dust jacket. N.D.. Hardcover. No statement of printing, no date on title or copyright page - possibly a first edition (all subsequent editions seem to have statements of printing). Yellow DJ, red lettering. DJ has some smudges and light shelfwear. .
London: Rupert Hart-Davis, 1972. Fifth edition, revised. Hardcover. Bookplate pasted to first free end-paper; some foxing; else near fine copy/several small tears repaired with tape. 8v0. Cloth. Pp. 212. 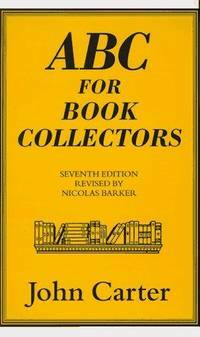 A very useful reference for book collectors, with definitions of such things as fore-edge paintings, hard-grain morocco, india paper, and tree calf. New York: Alfred A. Knopf, 1966. cloth, dust jacket. 8vo. cloth, dust jacket. 208 pages. Fourth edition (even though the jacket states "third edition." ). New York: Alfred A. Knopf. Good in Poor dust jacket. 1952. First American Edition. Hardcover. No Date. Bound in dark blue cloth with decorated boards. Pastedowns and endpapers printed in blue. Large piece missing from top of front panel of the DJ. Small amount of paper missing along the bottom of the rear panel near the spine. Soiling to the DJ. Sept. 22 written on spine and top of first endpaper in pencil. Wear to the corners of the boards. ; Small 8vo 7½" - 8" tall; 191 pages . NY: Knopf, 1970. 4th edition, Revised edn. VG in dj.208 pp. Indispensable. Alfred A. Knopf, 1977. Fifth Edition, fourth printing. Clean and unmarked. Full cloth binding. 211pp. Dust jacket is lightly rubbed and in a protective mylar cover.. Hard Cover. Very Good/Very Good. 8vo - 8" - 9" Tall. Fourth edition, as indicated on jacket. Fine in dust jacket. From Ira Gershwin's library, with posthumous bookplate. New York: Knopf, 1988. Fifth edition. hardcover. Very good +/very good +. 8vo. Black cloth with gilt spine titles. 224 pages. No names or marks. In dust-jacket (with price intact). A crisp, tight, unmarked, copy of the Fifth edition, revised. Alfred A. Knopf, 1953-01-01. Second edition revised. Hardcover. Good/Good. Good+ hardcover in good dust jacket. Binding is tight, sturdy, and square; text also very good. Some very light staining to top edge of book. Light shelfwear, fading to board edges. Light shelfwear, scuffing/dust soiling to dust jacket edges. DJ is not price-clipped. Previous owner's bookplate on front paste-down. NOT an ex-library copy, NO remainder mark, NOT a book club. Ships from Dinkytown in Minneapolis, Minnesota.